This is a major surgical procedure performed under general anaesthesia. It is usually performed in patients with a BMI greater than 35. The procedure involves the removal of three quarters of the stomach preserving a tube of the stomach with the direction of food flow to the small bowel also being preserved. Removal of big part of the stomach leads to a reduced appetite due to the loss of a hormone which normally stimulates appetite and in addition you can only eat a restricted amount of food. The operation takes place through small incisions, 0.5-1cm typical size, through which gas is inflated in order to create space and make internal organs easy to see. A long thin tube with a tiny camera at the tip (laparoscope) is then inserted into the abdomen guiding the insertion of further long specialised laparoscopic instruments which are used to perform the procedure. The amount of weight you loose will also depend on the types of food you eat and the amount of exercise activity you undertake. If you continue eating bigger and bigger meals with time your stomach can stretch back to its original shape. The way your body digests food is preserved therefore apart from the first two years there is no need for long term vitamin and mineral supplementation. You should expect to loose approximately 60-70% of your excess body weight over the first 12 months following surgery provided you are committed to a healthy diet and good exercise. If you suffer from type II diabetes, with weight loss your body will be able to control sugar better and medication may no longer be necessary to control your diabetes. A low fat liquid diet is recommended prior to your surgery to shrink the liver In order to help with surgery. A change in lifestyle and increased exercise in preparation for life after the procedure are also expected. After the procedure you will be taken to the recovery room. Patients need to spend two nights in hospital. You should be able to return back to normal activities and work after about 2 weeks. Your appetite will be reduced and you will feel full quickly but try to stick to small meals. You will need to employ a new balanced healthier diet potentially with the help of a dietician, making the relevant lifestyle changes to reduce your calorie intake and increase your exercise. Be careful of not to eat small amounts of high calorie foods often as this will reduce your weight loss. The risk of complications includes those relevant to any laparoscopic procedure such as infection, bleeding, blood clots, heart problems, pneumonia, urinary retention, development of a hernia, damage to organs inside the abdomen and anaesthetic risks. Specific complication risks related to this procedure include the risk of the stomach leaking/bursting along the cut and stapled line (1-2%). This is potentially a major complication and may lead to further surgery in the future. 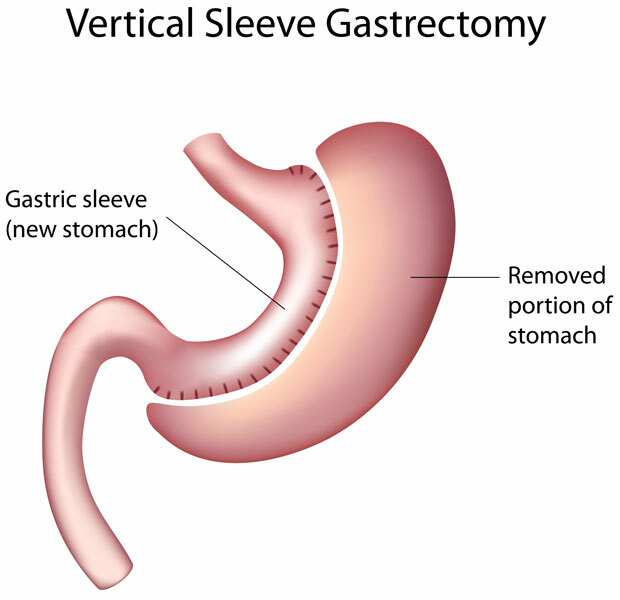 Also with time the weight loss effect of the sleeve gastrectomy can diminish due to increased volume of food eaten stretching the stomach into a bigger size.